The MicroVue DPD EIA offers a laboratory test that measures deoxypyridinoline cross-links (Dpd), a specific marker of bone resorption which is excreted in the urine. 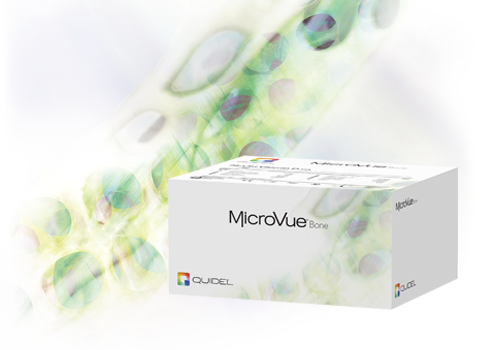 MicroVue DPD EIA provides a quantitative measure of deoxypyridinoline (Dpd), a cross-link of bone type 1 collagen released during the resorption process. Dpd is excreted unmetabolized in urine. Elevated levels of urinary Dpd indicate elevated bone resorption in individuals. MicroVue DPD is a urinary assay that provides a quantitative measure of the excretion of deoxypyridinoline (DPD) crosslinks as an indicator of bone resorption. Elevated levels of urinary DPD indicate elevated bone resorption in individuals. Measurement of DPD is intended for use as an aid in monitoring bone resorption changes in postmenopausal women receiving hormonal or bisphosphonate antiresorptive therapies and in individuals diagnosed with osteoporosis.